The worship of God is at the center of all life! The same is true of the life and mission of First Baptist Church of Marion. In times of corporate worship, we honor God by placing him first and foremost as we seek to be the people and presence of God in this time and place. Our worship services include a variety of expressions that speak to our multilayered relationships with the vast Triune God: Father, Son, and Holy Spirit. We offer praise, confess our sins, and affirm and proclaim the Good News of God’s love. We receive assurance of God’s forgiveness, listen for the voice of God, and dedicate ourselves in response to God. All these aspects of worship occur in various mediums including prayer, readings, Scripture, singing, silence, and preaching. The Ordinance of Baptism is observed as those are led to commit their lives to Christ. The Lord’s Supper is observed bi-monthly and on special occasions, keeping the witness and promise of the meal before us throughout the year. Worship at First Baptist Church is God focused. We recognize that worship is not about us. Authentic worship is about God! To use the metaphor of drama, we seek in worship to be players on the stage of life with God as our audience and benefactor. All that we do in worship we do to glorify God. Worship at First Baptist Church is liturgical. The root word for “liturgy” in Latin literally means “the work of the people.” Therefore, worship is the work of the whole congregation seen by their participation in so many elements of worship: singing, praying, reading, listening, and giving. Worship leadership is provided not only by our pastors, but also by people from throughout our congregation. Children and youth help lead worship every Sunday along with adults of various ages. 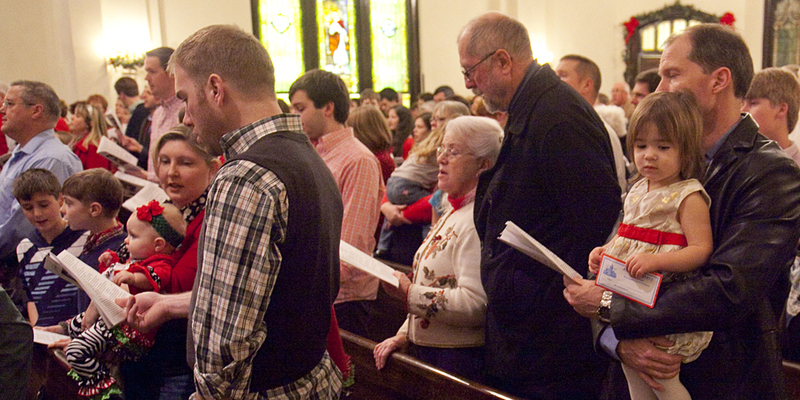 Worship at First Baptist Church follows the Church Year. Our congregation follows the calendar of the church, which includes the celebrations of Advent, Christmas, Epiphany, Lent, Easter and Pentecost. This annual cycle of biblical themes and readings guide us in worship and proclaims God’s wonderful salvation story. The various colors of the Church Year help emphasize each holy day and season. Worship at First Baptist Church includes excellent music. The Music Ministry is one of our congregation’s greatest gifts. For over 50 years, First Baptist has provided voice and hand bell choirs for people of all ages. The Music Ministry also provides cantatas and other special offerings throughout the year. If you are interested in worship at First Baptist Church of Marion, you can learn more from the information and pictures on this website or by joining and watching the daily posts on our Facebook group page. However, the best way to find out about worship at First Baptist is to join us!